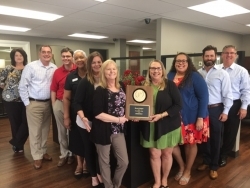 Jenks, OK, December 04, 2018 --(PR.com)-- This top award recognizes the agent’s outstanding sales ability, plus honors agents who align their business with the long-term direction of the company and who act as advocates for their customers. Only 50 agents a year are granted this award for being a top agent in a particular line of business or in multiple lines. This is an amazing accomplishment as State Farm has over 19,500 agents. Brent has been supplying insurance in Tulsa for State Farm since January of 2007. He joins a select group of other agents across the country who’ve been honored with this prestigious award. Brent is an active member of the Tulsa community. He supports multiple Jenks School organizations. He also supports John 3:16 Mission, which does incredible work with the Tulsa area homeless. “Helping our community is important to us. We believe it is important to give back. For home and auto insurance in Tulsa and surrounding areas, contact Brent Hagar’s State Farm Insurance Agency today. On top of home and auto insurance they also provide life insurance and commercial insurance as well as financial services products. · About Brent: Brent has been married to Carla Hagar for 33 years and they have four daughters and one grandson. · Born: Brent was born in Oklahoma City but grew up in Ada, OK where he attended High School and College. · Degree: Brent received a B.A. Degree in Sociology from East Central University in 1981. · Years in Tulsa area: After spending almost 20 years in the Dallas area, Brent and family moved to Tulsa in 2006. · Favorite Book: Brent’s favorite authors include John Grisham, Tom Clancy, Vince Flynn and Brad Thor. · Hobby: Reading and traveling are what Brent likes to do when he’s not working. The mission of State Farm is to help people manage the risks of everyday life, recover from the unexpected, and realize their dreams. State Farm and its affiliates are the largest provider of car insurance in the U.S. and is a leading insurer in Canada. In addition to providing auto insurance quotes, their 19,500 agents and more than 65,000 employees serve 81 million policies and accounts – more than 79 million auto, home, life and health policies in the United States and Canada, and nearly 2 million bank accounts. Commercial auto insurance, along with coverage for renters, business owners, boats and motorcycles, is also available. State Farm Mutual Automobile Insurance Company is the parent of the State Farm family of companies. State Farm is ranked No. 43 on the Fortune 500 list of largest companies. For more information, please visit https://www.statefarm.com. Brent Hagar's State Farm Agency, serving the Tulsa community, has received the company's prestigious President's Club Award.